Sparks Mexico: First storm of the season ? First storm of the season ? Well, the first that will directly affect us. Lots of storms and a few hurricanes but all well offshore. This has possibly the driest summer in the 10+ year I've been here. Hopefully this will dry out the surrounding farmland so more crops will be planted. We'll find out in the next few days. Regardless of development, gusty winds and heavy rains causing flash floods and mud slides are expected in coastal portions of the Mexican states of Oaxaca, Guerrero, Michoacan, Colima, Jalisco and Nayarit this weekend into early next week. 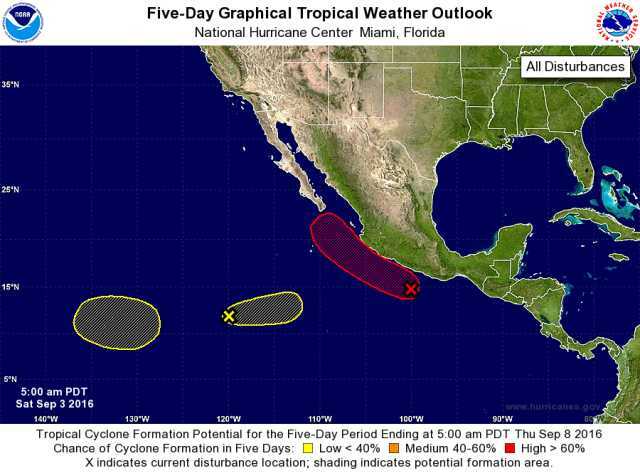 Interests in these areas and Baja California Sur should monitor the progress of this disturbance. The U.S. Embassy cautions U.S. citizens that severe weather is expected to bring gusty winds and very heavy rains to southwestern Mexico. Total rainfall amounts of 5 to 10 inches with isolated totals up to 15 inches are expected through the weekend into early next week over the southern Mexican states of Oaxaca, Guerrero, Michoacan, Colima, Jalisco, and Nayarit. These rains could result in life-threatening flash floods and mudslides.